Many of us aren’t able to perform even the simplest tasks before having an espresso first. Or five. And there’s nothing wrong with that. We realize we’re addicted to caffeine, but we’re okay with it. Everybody loves coffee, but not everybody loves the price tags attached to the vast majority of e﻿spresso machines. Unless you have a coffee shop right down the street, you have to wait a while until you get to work and you can finally clench your fingers around your precious cup of energizer. These machines are expensive, and there’s no warranty that they’re going to last forever. In other words, they’re usually just holes in one’s budget. And in some cases, the coffee isn’t even that good, to begin with. How can I brew my espresso without an espresso? It sounds like an impossible thing to do, but, in fact, it’s quite doable. There are three main methods of doing it and we’ll provide you with complete guides on all of them. The French press is one of the cheapest alternatives when it comes to coffee brewing machines. You can purchase one for around $30 or even less. Its price depends on the size; so the bigger it is, the more expensive it will be. If you’ve never seen one of these, you probably have no idea what a French press is. It’s a life-saver, that’s what it is. But let’s get a little bit more technical: basically, a French press is a thermos-like container with a piston that runs through the lid and the middle of the pot. That’s all there is to it. Straightforward and efficient technology. Brewing a delicious cup of espresso doesn’t really get any easier than this. All you need is coffee grounds and hot water. This is how to do that. Make sure you’ll get coarse grounds because fine ones will make your coffee muddy. The piston that goes to the bottom of the press will not be able to hold those fine grounds down, and nobody wants to pass the coffee through a sieve. 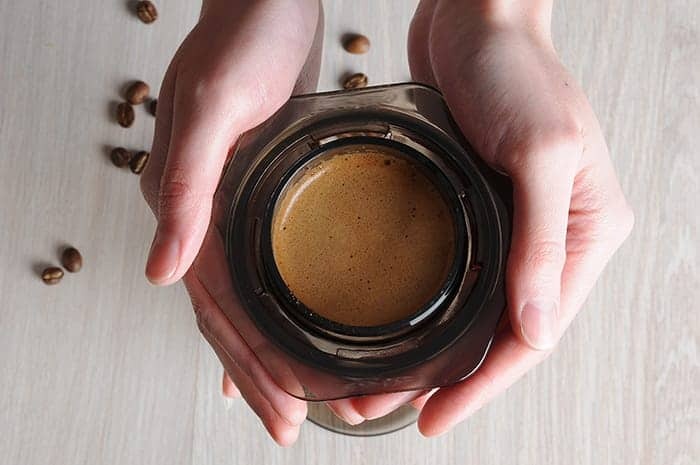 You’ll need 4 tablespoons of coffee for 2 cups of espresso. 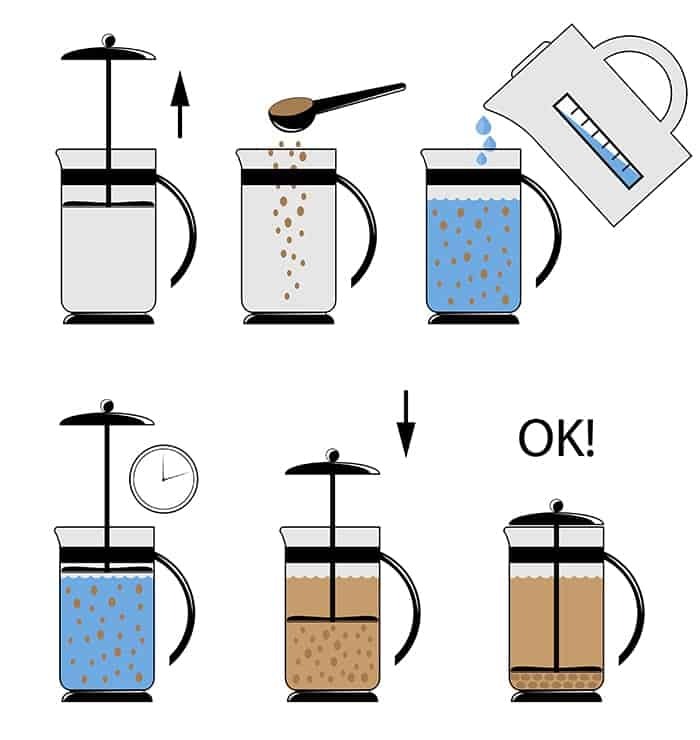 This is probably the most important step, and it does not limit its application to brewing with a French press only. If the water isn’t hot enough, your espresso will have a horrible taste. Why? Because it will not initiate the extraction of the coffee. What you’ll get is tepid water with a hint of coffee taste. Make sure the water actually boils. Let it cool off for 20-25 seconds. You’re already halfway there. Add the grounds and pour just a little hot water over them for now. You’ll see that as quickly as the water hits the grounds, the smell is utterly fantastic and the coffee starts to look like a geyser. That’s called “bloom.” It’s essentially the moment when those grounds release all the substances and the essential oil they contain. If you want, you can skip this step, but the espresso won’t have that rich taste you get if you allow your coffee grounds to bloom first. Stir the grounds gently so they mix with the water. Don’t stir too energetically; the purpose is not to make a vortex in the press. You just need to stir the grounds a little bit so the water can start the extracting process. This is absolutely vital and not respecting this step here is a waste of money and good coffee grounds. For the perfect espresso, the grounds have to steep for 4 minutes. Not 3, not 5 – precisely 4 minutes. If it steeps more than that, it will be bitter. One more thing: do not press the plunger as the coffee grounds are steeping. After 4 minutes have elapsed, you’re ready for the final stage of espresso-making with the French press. Do not do it in one motion. Again, do it gently. If you meet any resistance as the plunger goes downwards, take it backward just a little bit and then resume plunging towards the bottom. Retract it once you’ve reached the lowest point. Yes: pour your espresso right away, to avoid bitterness. And that’s it! You’ve just brewed your first espresso with a French press! Quite easy, right? Yes, but believe it or not, the other two methods are even better for preparing espressos than this one. The Moka pot is the mother of an espresso so strong that it will knock your socks right off of your feet. This type of pot is not for the faint of heart, but only for those who cannot imagine waking up and not having an intense cup of coffee before they even brush their teeth. The technology in a Moka pot is considerably more “advanced” than the one in a French Press, and it takes more time to brew an espresso. But believe us: it’s worth the wait. 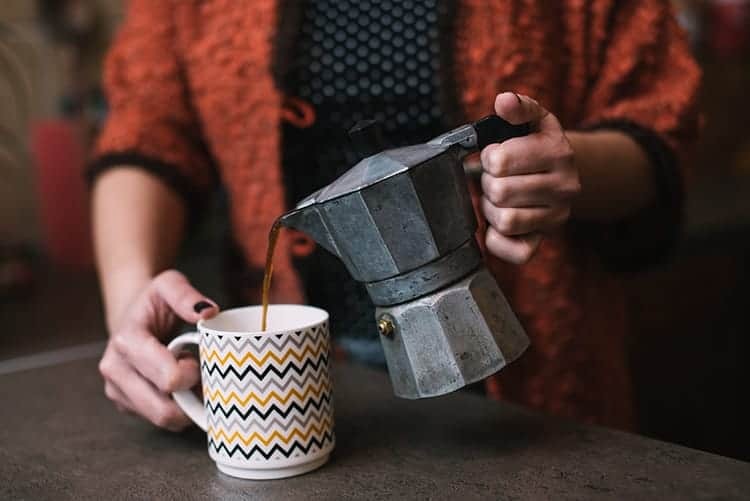 You definitely know what a Moka pot is and how it works. That warrants us to jump directly to business without beating around the bush. We mentioned that a French Press is not that efficient in making espressos. Why? Because a good espresso is made when hot water passes through the grounds with a huge pressure. The French press isn’t able to generate that kind of pressure – but the Moka pot is. Here’s how you make your espresso with this device. For the French press you needed coarse grounds, but the situation is different in the case of the Moka pot. You must grind the beans as finely as possible. The pressure generated by the lower chamber of the container will pass the water through that powder easily, resulting in a strong, well-extracted espresso. Water can be pre-heated before being put in the Moka pot or not. It’s up to you. It doesn’t have too much of an effect on the ending result anyway. When you place it on the stove, it will heat rapidly. Pay attention to the valve on the side of the water chamber – the level of the water mustn’t pass it. If pressure builds up and it cannot be evacuated through that valve, the Moka pot can explode, and you’ll have to get your espresso from the walls. Make sure you don’t overfill it. There’s one common mistake that all those who make espresso with a Moka pot for the first time do: they push and level the grounds. Don’t do that. Water won’t pass through them properly, therefore the espresso will be very weak. First, clean the grounds that could potentially make the pot screw incorrectly, transforming your Moka pot in a hazardous little bomb. When you have a device that works solely on pressure, you cannot be careful enough. If you put a Moka pot on high heat, pressure will build up too quickly, and your espresso won’t be in the collection chamber. The sprout will spit it all over the stove. Low or medium heat is indicated. It’s quite easy to assess whether the heat is too low or too high: when it’s too low, coffee will barely flow through the sprout; when it’s too high, it will flow too quickly. Increase or decrease the heat accordingly. If you don’t want to get a bitter espresso, remove the pot from the stove just before the coffee rises and gurgles. Once the brewing process stops, pour your espresso in a cup, or cups, depending on the size of your Moka pot. A Moka pot can be cleaned easily with hot water. You shouldn’t use the dishwasher, because it will give the pot an unpleasant patina in the long run. This is it! The Moka pot is undoubtedly the best device for making espresso. In order to make this brew, you need a lot of pressure – the kind of pressure you cannot create physically (somewhere around nine bars). The French press and the Aeropress, which we will cover soon, can brew espressos, but they’re not as strong as the one you get with a Moka pot. Don’t worry; although it sounds like the Moka pot is quite expensive, it really isn’t. And on top of that, this device will last you forever, since it’s usually made out of stainless steel. There’s one more device that you can use to make a good cup of espresso: the Aeropress. What’s an Aeropress? Simple: the Aeropress is cousin with the French press. As a matter of fact, it’s a more portable and more recent (invented in 2005) version of the classic French press. Both these brewing devices function in the same way and are even built on the same principles. The Aeropress is a tube/cylinder, with a filter on the lower end. The coffee grounds are placed at the bottom, hot water is added and then the plunger is pushed to create pressure. As you press the plunger, coffee is filtered in the cup. Simple and efficient. If you need more visual cues, this one should suffice: imagine a syringe without a needle. That’s what the Aeropress is. Now let’s see how you can make an espresso with it. Like in the case of the Moka pot, you need extremely fine grounds. If the grounds are too big, you won’t get an espresso, because the water will just flow freely through them. The size of the grounds is the most important aspect of brewing espresso, regardless of the machine/device you’re using. Before you do this, you need to place a filter into the lower cap. A good idea is to pour a little hot water on it. Sometimes, filters can leave an unpleasant taste of paper. Hot water will obliterate it. Time to add the grounds. Shake the tube a little, so the grounds even out. Place a second paper filter on the lower end of the plunger. As you can see, the coffee will be stuck between two filters as you will press the piston. Why do you need two filters on the opposite sides of the grounds? This is for them to stay on the bottom of the tube. This is the first pressing. As quickly as you’ve reached the bottom with the plunger, retract it all the way up to the top. If the grounds look similar to a hockey puck, then you’ve done things right. One more step and you can enjoy your freshly brewed cup of espresso. The water should be around 100o C. You will see that there are certain markings on the side of the Aeropress. Put as much water as you think is best for the amount of grounds. We haven’t given an exact number because it’s all about personal taste. But, for instance: if you have 20-21 grams of grounds, you should put hot water up to the “2” mark. Now press the plunger again, slowly, and voila – you’ve got your espresso! The great thing about the Aeropress is that, unlike its kindred French press, the grounds don’t need to steep. What does that mean? You’ll get your espresso quicker, obviously. With this, our list of methods of brewing espresso without an expensive espresso machine comes to an end. But let us provide you with some more valuable pieces of advice vis-à-vis this strong, delicious brew. This last part of our guide will cover the four most important factors that contribute to brewing the best cup of espresso you’ve ever had. You definitely read this article because you are a beginner. Contrary to what you might think, it’s not the brewing device you’re using that guarantees that you’ll get the best espresso there is. It’s all in the beans. You can buy powdered espresso beans from any supermarket and store, that’s true, but you won’t get the same taste. Why? Because it won’t have that freshness you get when you brew an espresso with beans you’ve ground 5-10 minutes before. Pressure is the key element to a proper espresso. Anything you get with less than 9 bars of pressure is not really an espresso; it’s just plain coffee. It should come to no surprise to you that the Moka pot is the recommended machine in this respect. It is able to generate huge pressure. Therefore you’ll get an authentic espresso. The temperature of the water is crucial, too. If it’s warm, the grounds will not be extracted properly. What you’ll get in this case is warm, coffee-colored water… Water must be hot so that all the oils and nutritious substances in the grounds are released. All these will give that amazing taste. On the other hand, if the water is too hot, the grounds will be burned. Subsequently, the espresso will be bitter. The roast of the beans may affect the taste as well. If you’re not a fan of weak espresso, make sure you go for a lighter roast. By contrast, if you don’t like strong espresso, choose a darker roast. It’s a matter of personal taste, really. 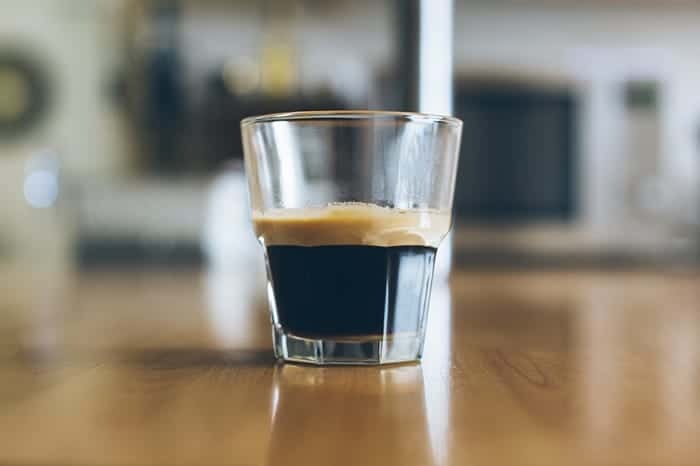 Brewing espresso is an art, and all these aspects we’ve outlined all throughout this guide should be enough proof that the statement is no exaggeration. There are so many things you have to take into consideration if you want a top-notch espresso. The temperature of the water, the roast, the pressure and the beans – all these are vital. This is why it will probably take a while until you can brew the perfect espresso. The good news is that you don’t need to spend hundreds of dollars on espresso machines. These three devices – the French press, the Moka Pot and the Aeropress – are a lot cheaper than 99% of automatic drip machines. They are not in the least less efficient than those, so their price doesn’t sacrifice anything from the quality. Make the right call and save yourself a ton of money by getting one of these amazing little espresso-brewing devices. We hope this article answered every question you might have had in regards to brewing espressos and the cheap devices you can use to do it. Go and brew your espresso!